Adolescence is a period of rapid growth, maturing individuality, vulnerabilities and fortitude. Fortunately, most youths go through this period of life in a healthy way, but some do not. Adolescent Mental Health: Prevention and Intervention is a concise and accessible overview of our current knowledge on effective treatment and prevention programs for youths who have developed, or are at risk of developing, mental health problems. Ogden and Hagen’s introduction to "what works" in the promotion of adolescent mental health addresses some of the most common mental health problems among young people, and how these problems might be prevented or ameliorated through professional and systematic efforts. The volume illustrates contemporary and empirically supported interventions and prevention efforts through a series of case studies, and covers some of the most prevalent mental health conditions affecting today’s youth; externalizing, internalizing and drug use problems. Within an ecological and transactional framework, the book discusses how psychopathologies may develop and the risks and protective factors associated with these. The problem-oriented perspective on risk and mental health problems is combined with a focus on social competence and other protective factors. 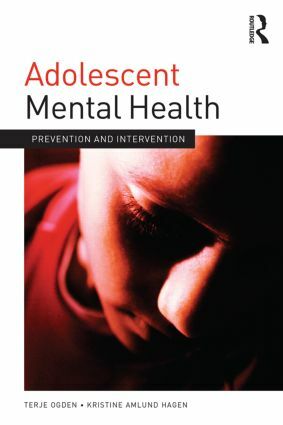 Adolescent Mental Health: Prevention and Intervention will be essential reading for students and practitioners in the fields of child welfare and mental health services, and any professionals working with adolescents at risk of developing mental health problems.